Being conscious on your health and potential health problems is a very important thing. For women, the sneakiest and deadliest diseases are breast cancer and ovarian cancer. While breast cancer has a good amount of survivors, ovarian cancer is fatal in most patients. This is because women don’t realize they have it until it’s too late. Dr Kate Wolin explained the ways to prevent ovarian cancer. Cutting out some stress and dairy products, while starting a birth control pill can help. Being a woman in 2013 can be stressful. You are trying to move up the corporate ladder while juggling family life. 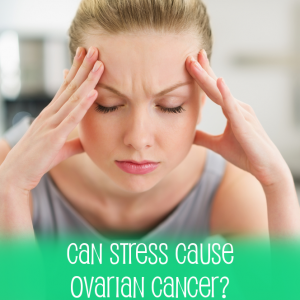 The stress and estrogen in your body can cause a lot of problems that you don’t find until it’s too late. Dr Kate Wolin said that patients who are 25 pounds or more overweight have a much higher risk of ovarian cancer. The chances increase with weight and obese patients are 25% more likely to die from ovarian cancer. Dr Wolin said that the ideal waist size is 32 inches and BMI needs to be 25 or lower to decrease the chances for ovarian cancer. Laughter can reduce your stress, along with meditation, prayer and exercise. Interesting news for women is that those who have never had children or been on birth control pills have a higher risk of ovarian cancer. Dr Diljeet Singh said that hormones are the reason. Ovulation causes a tiny tear in the ovary. This is where estrogen can feed cancer cells to grow. But when you have had kids or take birth control, progesterone is present. Cell damage has been seen to decrease by 50% in patients that take birth control over a five-year-period. The more children you have, the lower the risks as well. The ovaries shut down during pregnancy, preventing tears, and you have naturally high levels of progesterone. Breastfeeding your babies only helps. Dr Kate Wolin adds that limiting your dairy intake can lower your cancer risks. Those women that have more than 30 grams of Lactose per day (three servings+) have a 25% higher risk of getting ovarian cancer. Dairy is important to your diet, but you should limit your in take to 10 grams a day. Dr Wolin said that almond milk, soy milk, and soy cheese are great dairy alternatives. Ovarian Cancer does run in the family. About 10% to 15% of Ovarian Cancer cases are hereditary. You have to look at both sides of your family, so Dr Wolin and Dr Oz suggest taking advantage of family get togethers to learn about your health as you age.